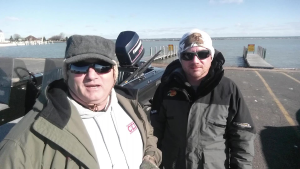 Jeff and I headed out to test the waters in Lake St. Clair for early season bass on Friday. 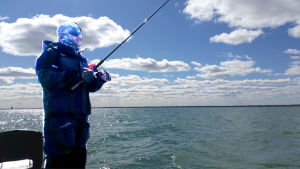 Since the new regulation for catch-and-release went into effect, there have been reports of anglers doing well in March. Unfortunately for us, the weather has been marginal at best, but it was time to give it a try. The forecast called for light north winds, sunny and 40-degree air temperatures. Not that it was going to stop us but what we got were strong and steady north winds, partly sunny and 30 degree air temps. That kind of difference does change the bite, and change spot selection. 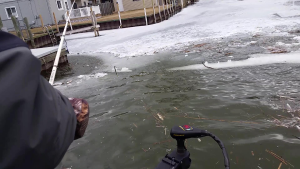 At Fair Haven, there was still ice in the canals and an average number of “winter kill” gizzard shad that were about 11 inches long. We switched gears and headed to the Metro Beach (St. Clair Metropark) area to hit Black Creek and canal outflows (Marked Map, Metro Beach #12). The water temps were 38 degrees, water quality was a desirable light stain and there were no fish species of any kind to be found. 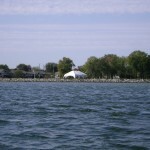 Fishing shallow structure that is close to shore is a high percentage choice for this time of year through May. Our last stop was a spot deep in the Mile Roads that was exposed to the wind. In terms of catching the smallmouth here, strong wind is always a plus. 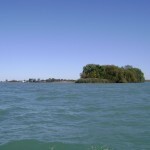 The lack of a bite on this day tells us that we might be a little early for the migration toward shore. The water temperature was 37 degrees (Marked Map, Mile Roads #8). Next trip out, we will probably head out deeper to find them. The forecast for the coming week is all over the place. There are some rising temps and favorable wind directions early on, then a shift to the east is in play. East winds are the least desirable on the U.S. shoreline at this time of year. Every day this week there is a forecast of either rain or snow. If nothing else, the warmer nights and days plus rain should bring the water temperatures up a bit.